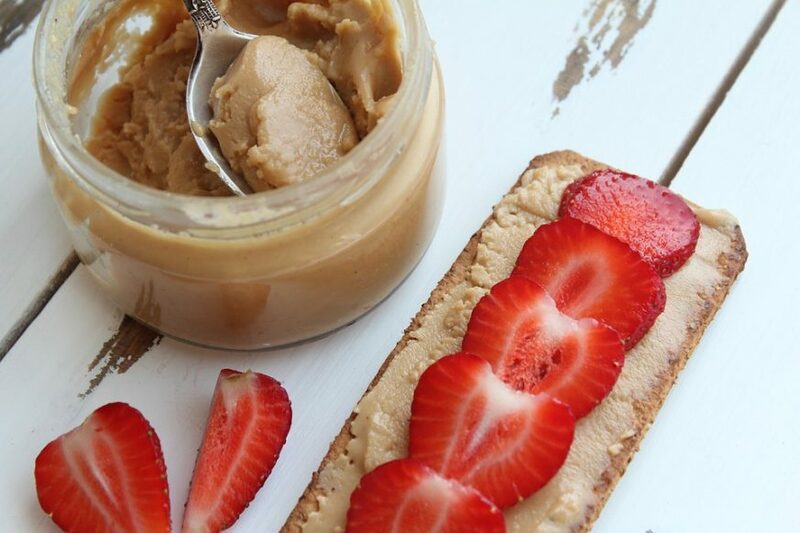 Peanut butter is so versatile and is wonderful on so many different things. Spread it, dip it, or simply eat it on a spoon. Peanut butter is a great snack because it has healthy fats, carbs, and protein which will give your little one energy throughout the day. Sometimes snack time can get a little boring with the same thing every day. 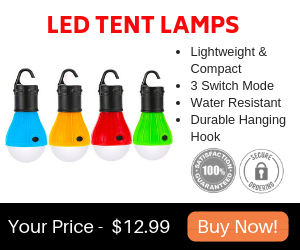 This article is for you if you’re looking to add a little fun and creativity to snack time. Here are 5 creative peanut butter snacks for your kids to enjoy. These simple treats will bring a smile to your children’s faces. Start by making peanut butter sandwiches with some Ritz crackers. Then dip the sandwich in some melted chocolate and place it on some wax paper to cool. 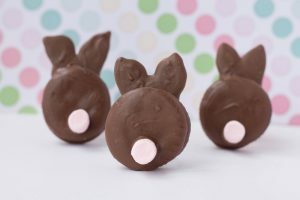 Pipe some melted chocolate onto the cooling chocolate covered sandwich to create bunny ears. Next add a mini marshmallow to create a little, fluffy tail for the bunny. These peanut butter snacks will spark some imagination in your little ones. These peanut butter snacks are as easy to make as ants on a log, but just a little different. 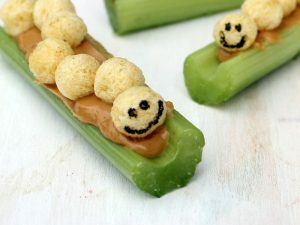 Put pieces of Kix cereal on your celery instead of raisins. It adds a little bit of a crunch and a different texture than ants on a log. Use an edible marker to create silly faces on your caterpillars. Edible markers are just pens filled with food coloring. Your kids will love this fun twist on a classic snack. Ladybug peanut butter snacks are a great way to brighten up anyone’s day! This is a nutritious and delicious snack for all of your children. Simply cut a red apple in half, then in half again. Stick two-quarters of your apple together with peanut butter. 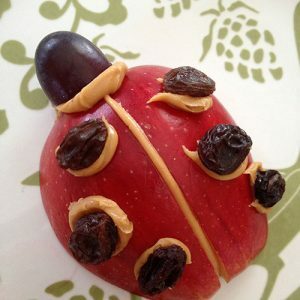 Then place raisins on the back of your apple to look like ladybug spots. 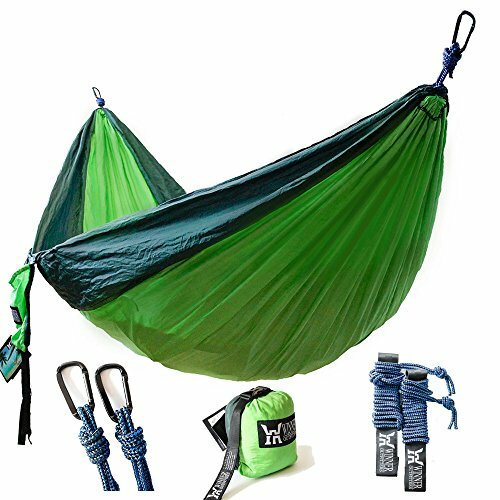 Next just put a grape at the top with some peanut butter to create a little head. You can feel good about giving your children something creative, yummy, and good for them. 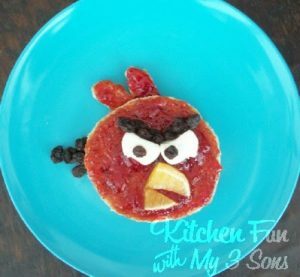 Fans of angry birds will love creating these fun peanut butter snacks! Use a cookie cutter or a cup to cut out circles in two pieces of bread. Then spread peanut butter on a circle slice and jelly on the other slice. However, instead of putting the fillings together like a traditional sandwich, have the jelly side facing out so that the red color is on top. Create little feathers for the head with your scrap bread and put jelly on it to give it the red color. Then use an orange or clementine slice for the beak. Cut a marshmallow in half for the eyes and put raisins on it for the pupils. Now just use raisins to create the angry eyebrows and the tail. 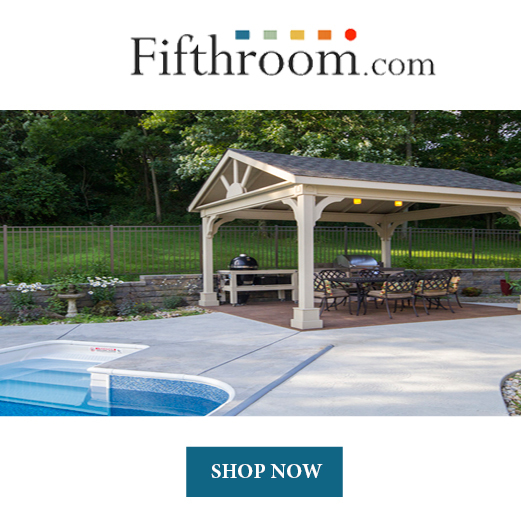 Your kids will love their creations! Since Valentine’s Day is quickly approaching, it seemed fitting to include some heart shaped peanut butter snacks. These homemade Reese’s peanut butter cups will make all your kids super happy! Plus you’ll love them too. All you need to do is mix peanut butter, powdered sugar, and butter together and spread it out evenly on a cookie sheet. Put the peanut butter mixture in the freezer for at least 2 hours. Then use a heart-shaped cookie cutter to create peanut butter hearts. 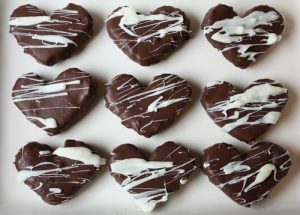 Then dip each heart in melted semi-sweet or milk chocolate and place it on a rack so the excess chocolate can drip off. Drizzle white chocolate on top and put the hearts back in the freezer to set up. Your kids will love helping with this fun Valentine’s Day treat. Give them to friends, neighbors, or teachers to show your love. These peanut butter snacks are sure to add some fun to your family’s snack time. Say goodbye to boring peanut butter snacks, and hello to the snacks that make your kids smile. Try these awesome snacks to brighten up a cold, dreary, Winter day.